It is a long time since my last post. It looked like that I stopped flying. Luckily I am still flying and actually I have now also the instrument rating (IR/SE) for more than one year. In December 2011 I have started with the theory at GTS in Bournemouth, UK and in April 2012 I have passed all 7 exams at UK CAA at Gatwick airport. Then 50 hours of flying and in October 2012 I passed also the practical exam. So now I have more options available although my Mooney is not equipped with any kind of device for deicing. Therefore I have to be very careful about any icing conditions. This means that I have more options regarding takeoffs and landings in non VFR conditions. In last year and few months I had done several true IFR arrivals and approaches. All these flights were not possible if I would be licensed only for VFR flying. Or saying in another words, these flights should be postponed and done in a different way. But let us start with the latest flight from Slovenia to Bulgaria in winter conditions. I was invited to participate in an event in Sofia taking place on February 21st. Due to cyclonic weather in the area of Mediterranean Sea the weather over Balkan area was very unstable with frequent rainy periods. The temperatures were surprisingly high for the winter period. When flying to Bulgaria the freezing level over Bosnia and further to the east was at FL 100 what one can expect during the spring or early summer. When I have landed in Bulgaria the temperature was 21 degrees of Celsius, what is quite unusual. The satellite images video for February 19th 2014 can be found here. So any kind of weather planning was almost impossible as all forecasts were changing daily so it was hard to decide what time period would be the best for flying. Actually I have made the final decision just few hours before flying when I was sure that the return flight is also doable. I have departed on February 19th 2014 from my home airport Divača (LJDI) to Portorož (LJPZ) in order to refuel and exit from Schengen area because Bulgaria is in EU but is not in Schengen area. The weather south of Portoroz airport was not so bad, however embedded CBs were forecasted. This was the reason why I asked for visual departure towards ABLAT and then asked for direct route to PALEZ intersection which was according to the latest satellite image at the edge of the relatively bad weather. It turned out that the clouds base was at 5000 FT, so I have asked for postponed climb and the permission was granted. Weather was quite windy already in Portoroz where wind was from 120 degrees gusting from 14 to 25KT. Therefore at 5000FT it was quite turbulent but it can be easily spotted that the weather in the direction of the flight (heading 110M) is much better then on the south of airport. The freezing level was between 7000 and 8000 feet and I was lucky that although I had to climb to FL100 there was actually no ice in the clouds. The clouds were actually broken to overcast until I have reached clear weather over Bosnia (see the flight path picture). At about 1/4th of the route over Bosnia I have encountered extremely strong downdrafts. Full throttle and 2700 RPM was not enough to maintain FL100 and in few minutes I was down at FL97 although I was flying with speed for maximum vertical climb. ATC asked me to maintain FL100 but my answer was "Unable to comply due to strong downdrafts". So in few minutes I was back on FL100 and then I had strong updrafts which boosted the speed of Mooney to 160 Kt and more. The average speed for the whole flight was 128KT. These down- and updrafts occurred in clear weather. The rest of the flight to Sofia was uneventful. Approach in Sofia was with vectoring for ILS on RWY 09. There was no marshaller so I had to find stand 35 on the map and taxi there. The flight time was 3h42m. This was my second landing at Sofia airport. It turned out that they have actually reduced the handling fees. Overall landing and handling fees with 3 day parking were about 110 EUR. The price of AVGAS was few cents less than 3 EUR per litter. Flight back was on Friday February 21st. 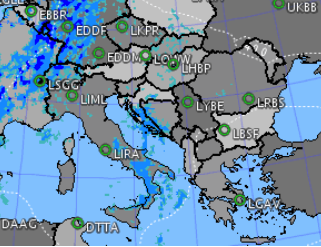 The significant weather forecast for the Balkan area from FL100 to FL400 was predicting large area with turbulence and icing from below FL100 to FL150. Most of the airports on my route back home like LYNI, LYBE, LDOS, LDZA had low clouds and poor visibility. The IR satellite picture was showing tops of clouds at FL200 or more, but the clouds layer was pushed to the north and the weather situation was improving. Weather in Sofia was great with some clouds at 8000 FT and departing towards GODEK point was completely in VFR conditions. After passing Serbian border I was soon cleared direct to TUVAR point which is on the border with Croatia. Close to Croatian border I had to climb to FL120 as I was on top of the clouds layer with the outside temperature of -2 Celsius. I have climbed to FL130 and further on to FL140 and finally to FL150 exactly in the area where the ice was forecasted (see the ice forecast picture). I have put on the cannula for oxygen supply soon after passing Bulgarian border in order to be ready when climb to levels higher the FL100 would be required. I am using the Portable-Pulse Demand™ Oxygen Controller. The weather was actually better then forecast and there was a piece of clear sky above Ljubljana airport. Due to quite intensive traffic in the time of my arrival to Ljubljana I was vectored for sequencing and luckily I was flying in different directions just above the clouds layer. During the final descend I found that there was actually no ice in those clouds. The satellite images video can be found here. 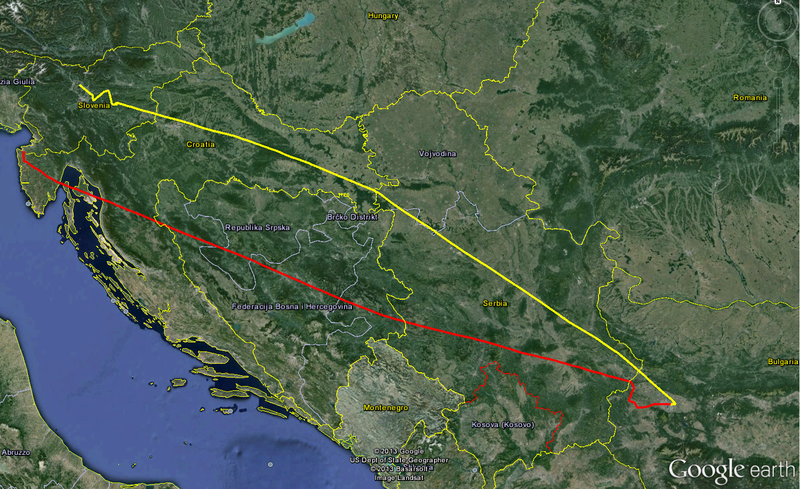 The overall flying time back to Ljubljana was 3h43m.